I met Monisha Bharadwaj on a Guild of Food Writer’s Food Trip to Hampshire with Hampshire Fare and it was the perfect time to ask about dahl. I’ve struggled to make dahl that tastes and looks delicious, yet exam boards seem to think is is a low level skill. Wrong! But why not ask the expert? 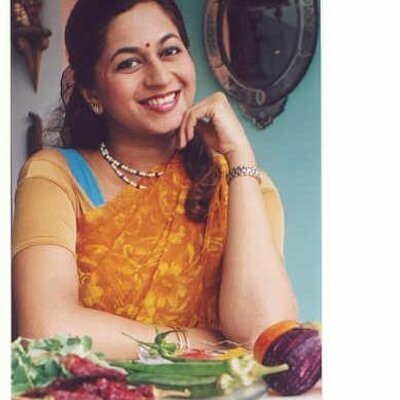 Monisha is an Indian Chef, TV chef, food writer, author and cookery teacher and she knows a lot about cooking dahl, rice and raita. Jenny – Do you think dahl is simple dish to make? Monisha – ‘You’ve got to have a lot of skills to make dahl. You need to know about sequence, proportion, balance and cooking time. How to cook the lentils properly to get the consistency right – getting the balance of spices and seasoning. There are many kinds of lentils and you need to know which type and colour to choose. Do you soak the lentils beforehand? How long will you cook them to get the consistency you need – how thick or soupy should it be? You need to get the spices and seasoning right to get the 6 tastes at the heart of Indian cooking – sweet, sour, salty, hot, bitter and astringent. For hot we use chilli, mustard and ginger. For bitter turmeric and cumin and for astringent turmeric and coriander. Jenny – So how is dhal made? Monisha – You need a high temperature frying oil to cook seeds, then onions, ginger and garlic. Then add tomatoes, spice powder and lentils and cook with water until the lentils are soft. Taste and season with salt. Cook further if the lentils need to be softer. Monisha – ‘I wash the rice, fry spice seeds, add the rice and add 2 times the water by volume. Boil then reduce the heat, cover and cook for 10 minutes. Then leave for 5 minutes to fluff.